This very special holiday villa to rent is situated in a wonderful location facing the sea at Elia Beach. 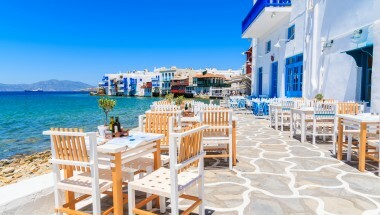 It benefits from magnificent sea views to the neighbouring island of Naxos. The beach at Elia is just 1 km from the villa, and Kalo Livadi beach, 3.5 kms. The accommodation comprises 5 bedrooms with 5 ensuite bathrooms, two large living rooms and a spacious, fully equipped kitchen. It has been furnished throughout with high quality modern furniture, which blends in well with its Myconian style. Amenities include air conditioning, Wi-Fi internet, satellite TV, DVD and i-phone docking station. A large pergola with BBQ and two terraces are surrounding the infinity swimming pool of the villa, one with pergola covered dining area with barbecue. There is parking space for up to three cars. 1 Master Bedroom, en-suite bathroom, second living room. 1 Double Bedroom, en-suite bathroom. 2 Double Bedrooms, each with private bathroom. Please do not hesitate to give us a call if you have any enquiries or specialist requirements, our representives are at hand to provide in depth knowledge and information on creating the best Luxury Travel Book experience. 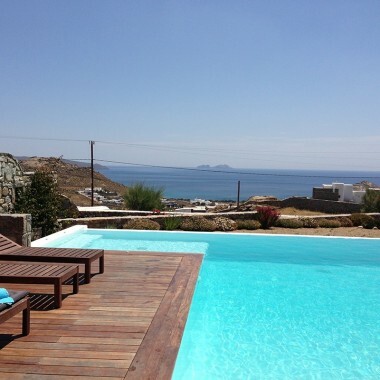 A beautiful holiday rental in a wonderful location facing the sea at Elia Beach. It benefits from two terraces, an infinity swimming pool, and magnificent sea views to the neighbouring islands. Specific pricing on request. Please enter a booking request for further information. Please check this box to be kept informed of new properties, news and special offers from The Luxury Travel Book mailing list. 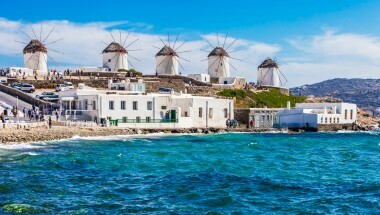 Luxury city apartments and villas to rent in beautiful destinations. Expand your travel book. Be the first to find out about exclusive offers and all the latest news.